Jim gives his talent, time, and resources to charitable causes in the communities he works and lives in. As a community leader, he strives to make a difference. 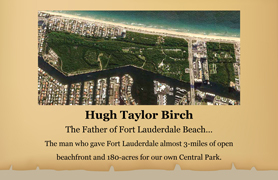 He serves as President of Friends of Birch State Park, Inc., Chairman of Riverwalk Fort Lauderdale, on the Board of the Downtown Development Authority (DDA), President of the Flagler Village Improvement Association, Inc., and is a member of the Beach Council of the Greater Fort Lauderdale Chamber of Commerce. He played a key role in spearheading a dramatic turnaround of the Lauderdale Beach Homeowners’ Association while serving as its President for 8 years. A passionate advocate for children, Mr. Ellis serves on the Board of Directors of the Museum of Discovery and Science and was previously a longtime Board Member of Jack & Jill’s Children’s Center. In 2014, Jim received the Citizen of the Year Award from the City of Fort Lauderdale and in 2016, he was the Hall of Fame Honoree at the Greater Fort Lauderdale chamber of Commerce Salute To Business Event. Since 2013, Jim has committed his time and resources to revitalize and BRING Hugh Taylor Birch State Park BACK while serving as president of the Friends of Birch State Park (“Friends”). Friends is a non-profit Citizens Support Organization whose function is to generate and employ additional resources to support Hugh Taylor Birch State Park. This is done through events and other fundraising activities, programs and community outreach. Friends provides assistance to the park staff through the purchase of supplies and equipment, as needed, in addition to a list of 40+ projects. Friends has secured more than $5 million in funds and commitments from various sources to fix the crumbling seawall, add a public floating boat dock, create a meditation garden, clean out Long Lake (phase I has been completed), install a new playground at the North end of the park (2016), purchase a brushcutter and golf carts (2014/ 2015), renovate the Terramar house (2015) and many other projects. Since 2016, Jim has been the Chair of Riverwalk Fort Lauderdale who’s mission is to be the catalyst in building and nurturing Riverwalk as a vibrant community connected by the New River. Riverwalk strives to oversee the Riverwalk park and district, plan for the future, assure compliance and help create an amazing destination downtown Fort Lauderdale. Current goals include the completion of the walk on the south side of the Riverwalk, Art in Public Places, free water trolley support, overall activation along the Riverwalk, including the Historic District, and 100+ annual events. Jim has been on the Board of the DDA since 2015. The DDA’s focus is to grow the downtown residential community, and the amenities that service it, and facilitate downtown’s physical and economic development. The DDA was established in 1965 to provide for the rehabilitation, redevelopment, and revitalization of slum and blighted areas in the Downtown. Current priorities for the DDA include the increase of downtown residential units, including affordable/ workforce housing, a downtown Government campus, mobility improvements, involvement in the Entertainment District and The Wave Streetcar. Jim has been the President of the Flagler Village Improvement Association (“FVIA”) since 2013. FVIA is a non-profit organization founded in 2003 to serve the best interests of the residents, property owners, local organizations, businesses and governments in Flagler Village and is actively working to improve the quality of life of the Flagler Village community. 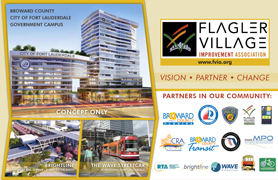 The Board of FVIA is comprised of active community leaders committed to the revitalization, beautification, security and success of Flagler Village.